Using Casting Simulation Software ADSTEFAN, all types of sand casting and shell molding process simulation is carried out at ProSIM. Using science based simulation practice, ProSIM has assisted customers for prediction of casting defects; optimisation of gating / methoding; selection of suitable sleeve (with appropriate modulus extension factor –MEF), selection of type of chills- number of chills and location, and assisted to increase the yield. 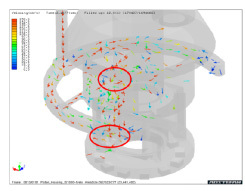 Figure above shows the velocity vectors of the molten metal in the mold. High velocity and turbulent flow is seen from casting simulation results. This clearly demonstrates the sand erosion from mold and formation of sand inclusion defect. Figure above shows the velocity of the melt flow at the ingate. Very high velocities are observed, indicating sand erosion. Figure above shows the melt flow simulation and in a sand casting. Figure shows the temperature distribution at the end of mold cavity filling. Figure above shows the solidification progress by simulation of sand casting process. It clearly seen that there are many pockets of regions where, shrinkage porosity is getting formed (as there are no chance of feeding these regions with molten metal). Figure above shows the cold shut defect formation in a sand casting simulation (left); and cold shut defect formation in a plant trial sample. Figures above show shrinkage porosity formation in a sand casting. 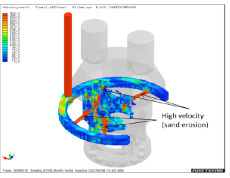 Top figure shows the shrinkage porosity defect prediction using sand casting simulation software ADSTEFAN. Figures show the shrinkage porosity defect in the components produced in the plant.